What a good book! Emma Gatewood was quite a woman. She was the mother of 11 and a victim of horrible physical abuse by her husband, until she finally got the strength to leave him and her remaining children behind. When she decided to hike the trail, in 1955, she didn't tell anyone where she was going or for how long. Her family was used to her going for long walks and were not worried. She went with tennis shoes and a bag she made herself to carry her few items she carried. Unbelievable, after comparing with what hikers take today. Despite her age and bad feet and inappropriate footwear, she made the arduous trek from Georgia to Maine. When reporters discovered her and articles starting appearing nationally about her undertaking (the first woman to hike it the whole way through), is when her family found out where she was! At the end, I think she went through five pairs of shoes and met quite a few people (not other hikers) along the way. Grandma Gatewood ended up doing the entire trail a second time and then a third time, but in sections. Then she walked the Oregon Trail! It was nothing for her to walk 5-10 miles just to visit somene. She just loved to walk! She is truly an inspiration, not only for "senior citizens" but for everyone. Was interested in reading this because it's about the Appalachian trail which I've been on a few feet of it in TN and MA. At 67, in 1955 she left Ohio and took a bus to WV and onto Georgia where she started her trail hiking. Love hearing of all the nature and can picture it all in my mind. Amazing that my family has relatives that live in the same town as where she was from. A wonderful story of a simple, laid-back woman who took life in stride. Her confidence, energy, strong work ethic and optimism carried her through a VERY demanding life. She was happy with her fate but when dealt a very bad hand, she didn't complain but just made the best of it. Many, too many wives suffered as Emma did, and had much less resources than women have today to change their circumstances. But...shockingly this problem continues at dangerously epic levels today! After children are grown and independent, Emma reads an article in National Geographic magazine which changes her life; allowing her to fortify her innate strengths and find fulfillment and peace within nature. She gets to meet lots of kind, curious people while helping the country recognize the importance of improving and maintaining our natural resources. I enjoyed Montgomery describing Emma's adventures in the context of US history, how the car compelled the creation of highways, and how that changed daily life for millions of Americans in both positive and negative ways, and the ensuing push back to invest in America's stunning hiking trails, shelters and parks. Grandma Gatewood is a national treasure. She remains level-headed and humble throughout her experiences.Her hard work as a daughter, wife, mother and hiker and activist are a celebration of life, and her legacy to us. This great grandmother sure had true grit. I'm glad Montgomery saw fit to share her amazing story so she can keep inspiring future generations. I haven’t read a book that was as much fun as this book – and as inspiring – in a very long time. 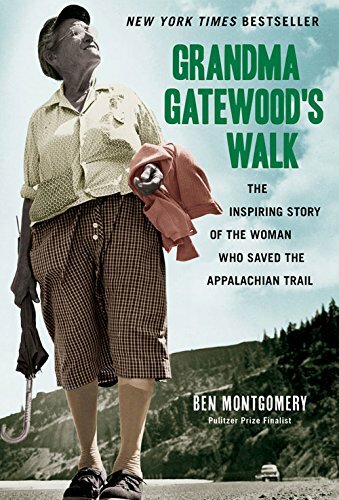 It’s about Emma Gatewood, a 67-year-old great grandmother from Ohio who, in 1955, became the first woman to walk the entire Appalachian alone. And, I might add, with “equipment” we’d use today to walk to the grocery store. Always a hard-working, no-nonsense, no-drama woman, she had eleven children and survived many hellacious years with an abusive husband – until she dumped him. The author very adeptly weaves the story of her earlier years with a wonderful narrative about her hiking adventure, along with the story of the Appalachian Trail itself. It’s the kind of book I won’t reveal a lot about so readers can make all the discoveries themselves.